The National Museum of the United States Air Force (formerly the United States Air Force Museum) is the official museum of the United States Air Force located at Wright-Patterson Air Force Base, 6 miles (9.7 km) northeast of Dayton, Ohio. The NMUSAF is the oldest and largest military aviation museum in the world, with more than 360 aircraft and missiles on display. The museum draws about 1 million visitors each year, making it one of the most frequently visited tourist attractions in Ohio. The museum dates to 1923, when the Engineering Division at Dayton's McCook Field first collected technical artifacts for preservation. In 1927, it moved to then-Wright Field in a laboratory building. In 1932, the collection was named the Army Aeronautical Museum and placed in a WPA building from 1935 until World War II. In 1948, the collection remained private as the Air Force Technical Museum. In 1954, the Air Force Museum became public and was housed in its first permanent facility, Building 89 of the former Patterson Field in Fairborn, which had been an engine overhaul hangar. Many of its aircraft were parked outside and exposed to the weather. Through the 1960s, Eugene Kettering, son of Charles F. Kettering, led the project to build a permanent structure to house the collections and became the first chairman of the board of the Air Force Museum Foundation. When he died in 1969, his widow Virginia took over the project. Her "determination, logic and meticulous attention" kept it on track, and the current facility opened in 1971. Not including its annex on Wright Field proper, the museum has more than tripled in square footage since 1971, with the addition of a second hangar in 1988, a third in 2003, and a fourth in 2016. The museum announced a new name for the facility in October 2004. The former name, United States Air Force Museum, changed to National Museum of the United States Air Force. The museum's collection contains many rare aircraft of historical or technological importance, and various memorabilia and artifacts from the history and development of aviation. Among them is one of four surviving Convair B-36 Peacemakers, the only surviving North American XB-70 Valkyrie and Bockscar—the Boeing B-29 Superfortress that dropped the Fat Man atomic bomb on Nagasaki during the last days of World War II. In 2010, the museum launched its 360-degree Virtual Tour, allowing most aircraft and exhibits to be viewed online. In 2016, the museum opened its 224,000 square foot fourth building, bringing its size to 1,120,000 sqft. The addition was privately financed by the Air Force Museum Foundation at a cost of $40.8 million. The building houses more than 70 aircraft, missiles, and space vehicles in four new galleries - Presidential, Research and Development, Space and Global Reach, along with three science, technology, engineering and math (STEM) Learning Nodes. In 2018, the Boeing B-17F Memphis Belle was placed on permanent public display in the WWII Gallery. The famed B-17F Memphis Belle and its crew became iconic symbols of the heavy bomber crews and support personnel who helped defeat Nazi Germany in WWII. The museum has several Presidential aircraft, including those used by Franklin D. Roosevelt, Harry Truman and Dwight D. Eisenhower. The centerpiece of the presidential aircraft collection is SAM 26000, a modified Boeing 707 known as a VC-137C, used regularly by presidents John F. Kennedy, Lyndon B. Johnson and Richard Nixon. This aircraft took President and Mrs. Kennedy to Dallas on 22 November 1963—the day of the President's assassination. Vice President Johnson was sworn in as president aboard it shortly after the assassination, and the aircraft then carried Kennedy's body back to Washington. It became the backup presidential aircraft after Nixon's first term. It was temporarily removed from display on 5 December 2009, repainted and returned to display on President's Day in 2010. All presidential aircraft are now displayed in the Presidential Gallery, in the new fourth building. The museum has many pieces of U.S. Army Air Forces and U.S. Air Force clothing and uniforms. At any time, more than 50 World War II-vintage A-2 leather flying jackets are on display, many of which belonged to famous figures in Air Force history. Others are painted to depict the air planes and missions flown by their former owners. 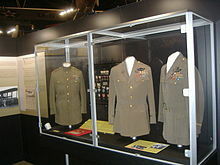 The displays include the jacket worn by Brigadier General James Stewart, P-38 ace Major Richard I. Bong's sheepskin B-3 jacket and boots, an A-2 jacket worn by one of the few USAAF pilots to leave the ground during the attack on Pearl Harbor, and President Ronald Reagan's USAAF peacoat. The museum completed the construction of a third hangar and hall of missiles in 2004. It now houses post-Cold War era planes such as the Northrop Grumman B-2 Spirit stealth bomber (test aircraft), the Lockheed F-117 Nighthawk stealth ground attack aircraft and others. A fourth hangar was completed in 2016, to house the museum's space collection, presidential planes, and an enlarged educational outreach area. Previously these collections were housed in an annex facility on Area B of Wright-Patterson Air Force Base (the former Wright Field). Because the annex was physically located on the base itself, museum guests were required to go through additional security checks before taking museum buses to the hanger. The museum has a large format theater that shows, for a fee, aviation- and space-oriented films interspersed primarily with other documentaries. The museum owns other USAF aircraft, including former U.S. Army Air Service, USAAC or USAAF aircraft, that are on loan to other aerospace museums in the United States and overseas, as well as those on permanent static display at various U.S. Air Force installations and tenant activities worldwide, and at Air Force Reserve and Air National Guard installations across the United States. The museum those aircraft, missiles and associated artifacts loaned to communities or civic organizations for display at civilian airports (many of them former USAAF and/or USAF bases), public parks and memorials, the facilities of military-affiliated organizations (e.g., VFW, American Legion, etc. ), or in other similar venues. Most of these loaned aircraft duplicate aircraft exhibited by the museum. These other aircraft remain the property of the Department of the Air Force and are typically identified at these locations as being "On Loan from the National Museum of the U.S. Air Force." The museum's staff has very high standards for the restoration and quality of care of loaned assets and has, in the past, revoked these loans when it was deemed that these other museums did not have the resources to properly care for an artifact. This happened in the case of the famous Boeing B-17 Flying Fortress, Memphis Belle. In 2013, the Air Force Museum Theater upgraded its theater from IMAX to digital 3D. This upgrade included a new stage, theater seats and a new theater screen to support a broader range of programming—including educational presentations, live broadcasts and expanded documentary choices. The renovations include a 7.1 surround-sound system, audio devices for the hearing or visually impaired, and personal closed captioning systems. The National Museum of the U.S. Air Force is in the midst of a multi-phase, long-term expansion plan. The Air Force Museum Foundation recently supported a major capital construction program that expanded the museum to the current 1 million square feet of exhibit space with the addition of the fourth building that now houses the Space Gallery, Presidential Aircraft Gallery and Global Reach Gallery. This new fourth building opened to the public on 8 June 2016. With the addition of new space, more than 70 aircraft that were in storage have been put back on display, such as the XB-70 Valkyrie. The Presidential Aircraft collection is also back on site, having been moved to an outside location for some time. The new building's construction was entirely funded via private donations from several different sources. ^ a b "History of the National Museum of the United States Air Force". National Museum of the United States Air Force official site. June 2007. Archived from the original on 8 April 2009. Retrieved 12 September 2008. ^ "Krista Strider". National Museum of the US Air Force. 28 April 2015. Retrieved 27 December 2016. ^ "Visitor info". Archived from the original on 26 November 2011. Retrieved 23 November 2011. ^ "Airfoce Museum Attendance". Archived from the original on 8 April 2009. Retrieved 5 April 2009. ^ US Air Force Museum Foundation (1972). US Air Force Museum. ^ McIntire, Bill. "Virginia Kettering". Dayton Daily News. Retrieved 18 November 2018. ^ "Expanding the Legacy". Issuu. Air Force Museum Foundation. p. 19. Retrieved 31 December 2015. ^ "History of the National Museum of the U.S. Air Force". United States Air Force. Retrieved 21 February 2017. ^ "Home of the Wright Brothers". National Aviation Heritage Area. Retrieved 16 March 2012. ^ Keen, Judy (20 November 2009). "JFK Relics Stir Strong Emotions". USA Today. Retrieved 20 November 2009. ^ "Air Force One temporarily off display at the National Museum of the U.S. Air Force". National Museum of the US Air Force. 22 September 2009. Archived from the original on 14 October 2012. ^ Bardua, Rob (7 June 2016). "National Museum of the U.S. Air Force fourth building now open". National Museum of the US Air Force. Retrieved 30 December 2016. ^ "Theatre - Air Force Museum Foundation". www.afmuseum.com. ^ "New Air Force museum hangar to open June 8". ^ "Air Force Museum to open fourth building". www.aopa.org. 26 May 2016. ^ "XB-70 Valkyrie moved into museum". ^ Nagy, Attila. "The New Home of the Most Exotic Bomber Ever Built Is Aerospace Heaven". ^ "Air Force Museum Foundation provides funding for museum". ^ Air Force Museum Foundation. Retrieved 4 February 2010.